“Joesph Gordon-Levitt trying to look like a ‘young’ Bruce Willis. It could have been worse, I suppose.” – Editor’s note. When faced at the end of the loop, the realistic style of director Rian Johnson’s “Looper” is both horrifying and engrossing. Have you ever wondered how the world with time travel would operate? “Looper” offers the most intense interpretation of this intellectual abstraction by showing how the mob of the future completes hits and assassinations with the sleek efficiency of a single process: take victims in the future, send them into the past, and kill them in a remote area and then have them incinerated. Since the hit never existed in the future, there is no trail of incriminating evidence for the officials to follow. The agents who carry out these hits are well-paid, highly-trained sentinels called Loopers. They’re equipped with socially distinctive, specially issued weapons used to instantly kill all victims sent to the past. However, these agents are dead men walking as each one of them is in charge of “closing their loop” sooner or later. In this alternate reality, Loopers are expected to execute their future selves to keep the mob’s hands clean of them. As recompense they’re given a small fortune for closing their loop during which time they may live up the rest of their 30 years as fast and furiously as their hearts desire. 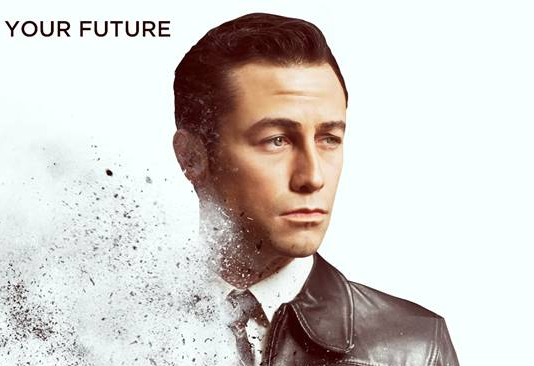 Enter Joe (Joseph Gordon-Levitt), a Looper who has been assigned to close his loop. But Joe from the future (Bruce Willis), has come back with a mission: to save his own life and the life of the woman in his future. The plot is so narrowly focused on the reality of the mob’s processes, that it loses much of its potential uplifting qualities which could balance the pervasive dreariness that dominates the movie. And what about the other ways time travel is used in this new universe? What about the other aspects of the culture of that time? The possibilities might be endless, but overall a little more scenery or world building would have been appreciated. But nonetheless, the themes in this film are aptly aimed at moralistic issues. Although there are one or two underdeveloped relationships that Joe has with Suzie (Piper Perabo) and Seth (Paul Dano) Joe’s fellow Looper, and there are a few static sequences with Willis as the sole driving force. Contrary to what has been said by others, it’s difficult for me to see how Bruce Willis tops himself in this movie. No barriers were broken in that regard. However, Joseph Gordon-Levitt does a great portrayal of Willis’ onscreen stereotype: he mirrors the incendiary spark of youth that once resided within Joe. Where Willis excels in this film is in his portrayal of the wizened-old man with a gruesome mission that necessitates the death of innocent people. At any rate, Joe’s loop must be closed, or the character risks a frighteningly disgusting death along with that of his future self at the hands of the mob. So the attitude of the young “live for today no matter what” and the attitude of the older “preservation of personal valuables at all costs” must clash in a dramatic conflict so the unadulterated truths and vulnerabilities of both no longer allow for any personal blind spots. And is there ever a clash! At times young Joe and old Joe are enemies, other times they’re allies, and other times they just don’t understand the direction of the other’s moral compass. But the film does look beyond the dilemma facing the two leading men. Emily Blunt plays Sara. She is a mother trying to protect her child from old Joe. As time passes, Sara is forced into becoming a deeply pained woman whose own past lays dormant until such times when it surfaces torment her. The power in Blunt’s performance is that she deftly allows her character to bring a kind of haunting claustrophobia to the film, which of course builds the tension as old Joe hunts for her son. When viewed in retrospect, this “Looper” demands to be taken seriously. It’s gritty to an extreme and is NOT for the faint of heart. But it is honest to what it is: a dramatic simulation of the moral discourse in regards to the past/future dichotomy. I look forward to seeing more of up-and-coming director Rian Johnson’s wonderful storytelling. Tagged 30, Bruce Willis, Emily Blunt, film, Joesph Gordon Levitt, Joseph Gordon Levitt, movie, Rian Johnson, youth. Bookmark the permalink.